The current President of France Emmanuel Macron is a man, as you might expect, of Gallic flair and charm as well as vaulting ambition. Un homme pour Le Grand Geste. So when he visits other World leaders and presents a gift it’s not going to be a silver salver! When he went to China Emmanuel gave his host a throroughbred Horse – Vesuvius. And now, in a master stroke of diplomacy, he has decided to ‘cement’ relations between France and The United Kingdom by loaning us the priceless artwork The Bayeux Tapestry (which just happens to commemorate the successful Norman invasion of England in 1066!). I will be at the head of the queue to see the Tapestry because it is a great work of art and craft with immense historical interest and significance. Not least be because it includes one of the first representations of the appearance of Halley’s Comet. For hundreds of thousands of years a bit of heaven has orbited our Solar System. Shooting across the sky – bright as a torch to the naked eye here on Earth about every 80 years or so. The Comet has been a part of recorded human experience since 467 or 240 BC depending upon which academic authority you rely. Lets just say Humankind has been looking up into the heavens for a very long time and wondering what sign or portent the appearance of Halley’s Comet could signify. 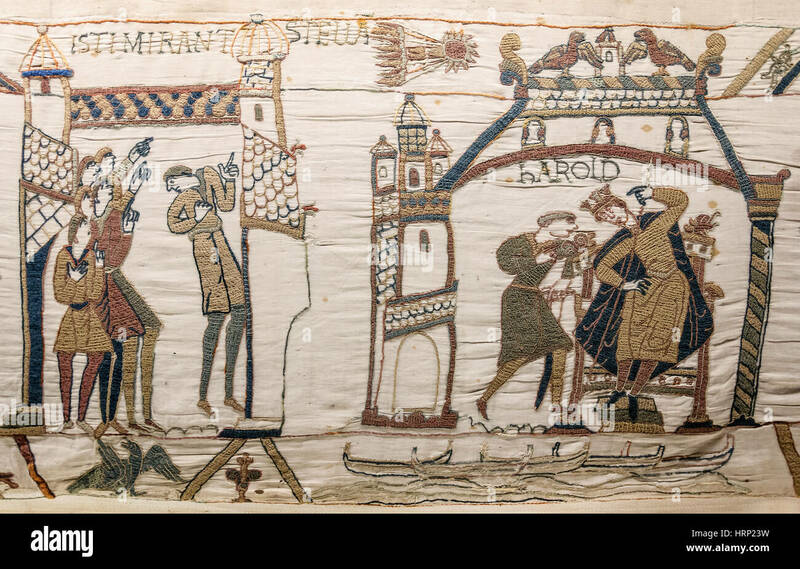 In 1066 for England’s King Harold – defeat in battle and death. For William of Normandy – conquest and a Crown. When it appeared in 1301 the great artist Giotto will have seen it blazing in the sky. It is surely Halley’s Comet that he used as the model for the Star over Bethlehem in his exquisite Nativity Of 1305. Just as artists have always looked into the night sky for inspiration so too have scientists and astronomers avid to map the heavens, predict orbits and understand the mathematical keys to the music of the spheres. Enter astronomer, geophysicist, meteorologist, physicist and mathematician Edmund Halley (1656 – 1742). Halley would make important contributions in many fields of science and win numerous honours including the Posts of Astronomer Royal and Savilian Professor of Geometry at Oxford. Yet, his immortality in the human imagination will undoubtedly rest on his correct calculation, published in 1705, of the periodic orbit of the comet now named after him. As predicted by Halley the comet reappeared in 1758 some 16 years after his own death. And, every 74-79 years it comes around again. It comes around again reminding us of the immensity of the Universe and our small place in it. When it came around in 1910 it shone above two great American writers – Mark Twain and Eudora Welty. Twain managed to be one of those fortunate enough to be alive for two appearances of Halley’s Comet as he was born in 1835 and died in April 1910. Characteristically, Twain wrote, ‘It will be the greatest disappointment of my life if I don’t go out with Halley’s Comet’. As Twain went out Eudora Welty came in (she was born in April 1909). In her wonderfully lyrical book, ‘One Writer’s Beginnings’ (get the Audio Book On CD she reads herself!) she makes reference to being a babe taken to the window in her Father’s arms when Halley’s Comet loomed above her native Jackson Mississippi in 1910. Among the admiring readers of that Book was Mary Chapin Carpenter one of the most highly literate and emotionally intelligent songwriters of our time. Mary is a writer who ponders deeply the dizzy ups and downs of life’s carousel before capturing our situations in songs filled with feeling, wit and craft. Her imagination caught by Eudora’s luminous prose she wrote a luminous, deeply touching, work of her own in, ‘Halley Came to Jackson’. Mary’s melody and lyric are tenderly poetic. Her vocal is both wistful and heartfelt while Mark O’Connor’s Fiddle reels in the passing years for all of us. There is always flesh and blood humanity in Mary’s songs; a present sense of the social, moral, imaginative and emotional plenitude every life is heir to. Daddy in the song will only get to see Halley fly this one time. Aware, as parents always hauntingly are, of the fleeting span of life we have allotted to us here he tenderly holds his infant daughter in his arms and prays that when Halley comes around again that, though he will be long gone, she will look up into the heavens and see it bright as a torch above Jackson again. And to that I say Amen .. Amen .. Amen. Halley is due again in 2061. None of us can know what joys and calamities will visit us between now and then. All we can do is have Faith. Have Hope. And Love. Make sure when Halley comes again and the wind is still that you look up and make a wish for the ones who will survive you. Dream a little dream of a Comet’s charms. This Post for Stephen, Irene, Kevin, Ronan and Hugh (not forgetting Cooper) with thanks for the welcome to The Kingdom and the hospitality. I don’t hold you responsible for the hailstorms but I do for the good fare and good cheer. Halley comes around again in July 2061. Given my dietary and exercise regime I hope to be around to share a toast then. If not, raise a glass for me. In addition to being a wonderful song ‘Halley Came to Jackson’ is also available as an utterly charming illustrated book by Mary Chapin Carpenter and Dan Andreasen published by Harper Collins. This entry was posted in 1980s, Music and tagged Eudora Welty, Halley Came to Jackson, Halley’s Comet, Mary Chapin Carpenter by Thom Hickey. Bookmark the permalink. Thanks. Charming and moving song. Regards Thom.